No birthday card screams "Party!" more than this one right here. Just take a look at those gold and purple twinkling lights. The font of the words looks like something straight from Broadway and is absolutely captivating. The dark purple bottom half adds a sense of simplicity and calmness, making this a perfectly balanced but still exciting choice! 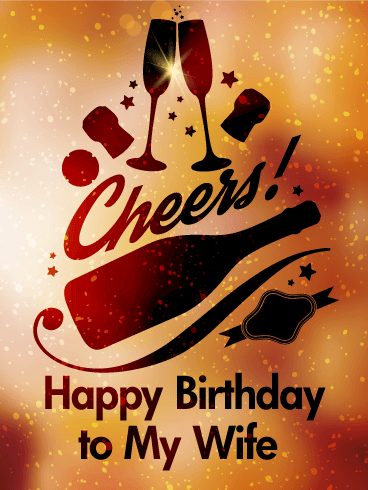 Let's all raise a glass and toast that special someone in your life on their birthday! This b-day card is a great way to do that. The champagne glasses add a fun element of celebration, and the bold, gold letters are sure to make a statement. This is a great b-day card for anyone in your life, and you can easily customize it based on whose birthday it is! If you're looking for an elegant birthday card without being over-the-top in the glitz and glam department, this is the card for you. Golden sparkles frame an elegant script wishing your friend or loved one a wonderful day. 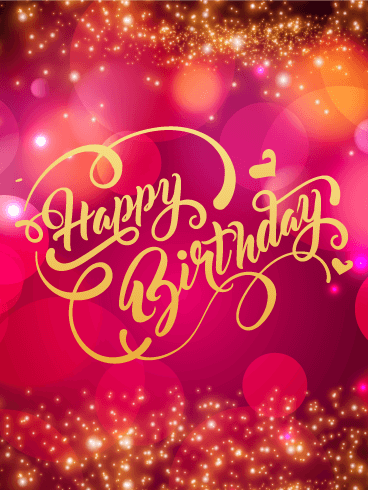 They will be grateful for the thought you put in picking such a beautiful birthday card that is the perfect combination of style and simplicity. Birthdays come but once a year! 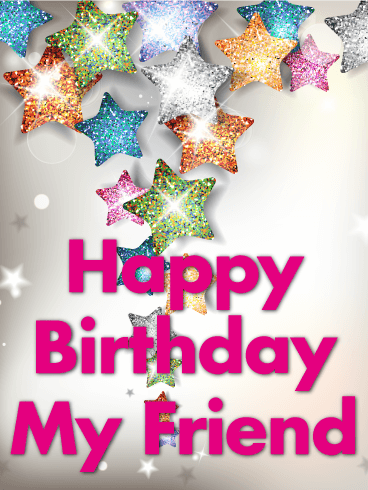 Don't miss the chance to wish someone close to you a very happy birthday with this starry birthday greeting card! 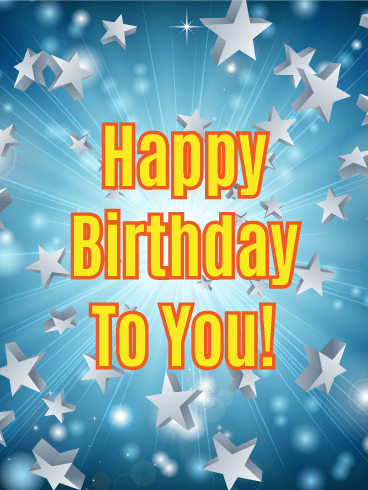 The stars have aligned—it’s never been easier to wish someone a happy birthday! 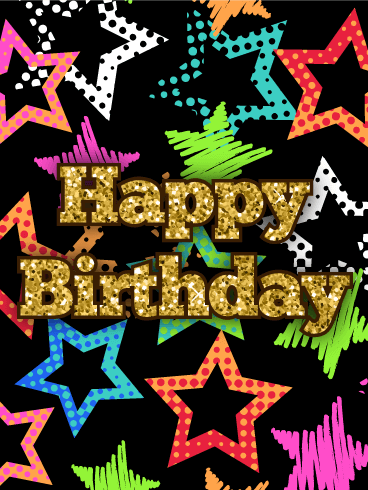 Our colorful and festive birthday cards deliver excitement and create more fun! 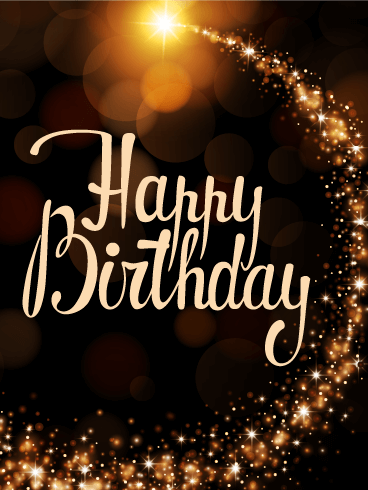 Whether you need a birthday card for a friend, coworker or family member, we have just the thing for you! Your friend has been a shining star and a guiding light in your life. On her birthday, let her know what her presence means in your life. 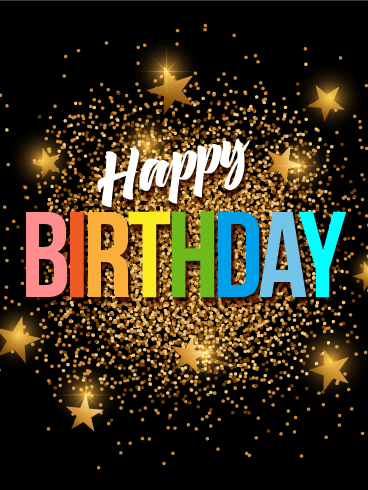 This birthday card features glittering stars in a rainbow of colors ranging from silver, pink, and blue to purple, green, and orange. The stars are pouring down onto a birthday wish for your friend. Celebrate good times! 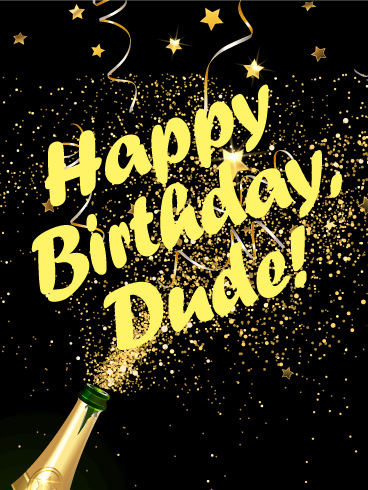 If your brother really rocks, send him this explosive and amazing birthday card! 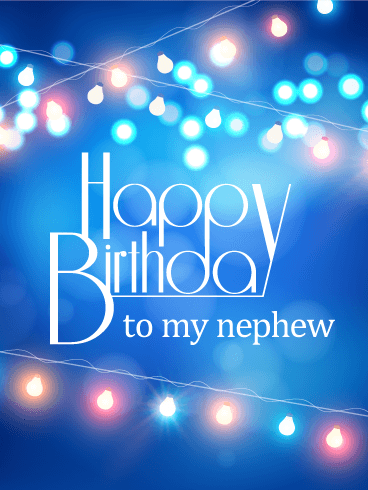 Send a birthday card to your brother this year on his birthday. 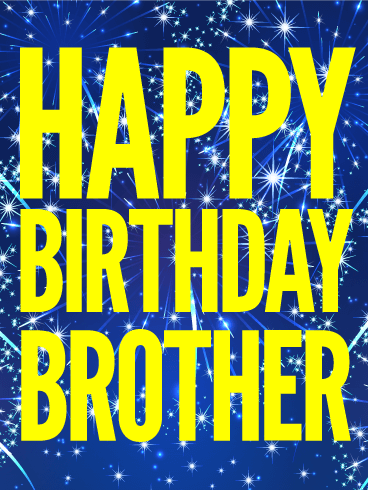 This bold and bright birthday card is absolutely a terrific way to celebrate your brother in an awesome and unique way! Send it today and wish him a great day. He won't soon forget it! 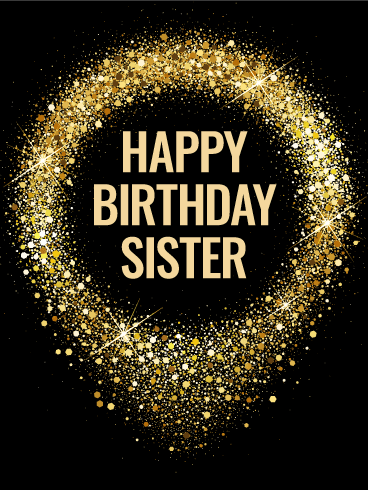 This chic and stylish birthday card is the perfect way to celebrate your awesome sister on her big day! A sleek black background with a shimmer of gold circling your greeting will put her in the mood to for a party. No matter how many candles will be topping her cake this year, she'll feel just as young and fabulous as ever, especially knowing you're right there wishing her an amazing year ahead! Rainbow birthday glamour! 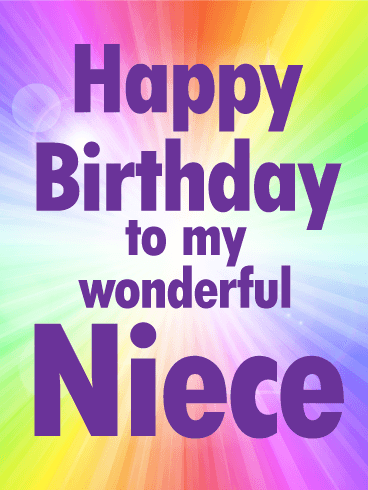 Celebrate your niece's birthday with this razzmatazz card that really pops. 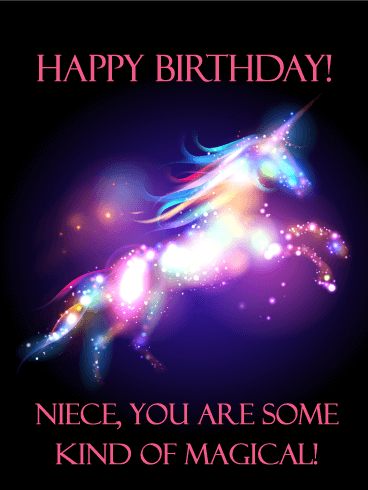 Wish your niece a great birthday with this stellar and one-of-a-kind birthday greeting. She will love it! 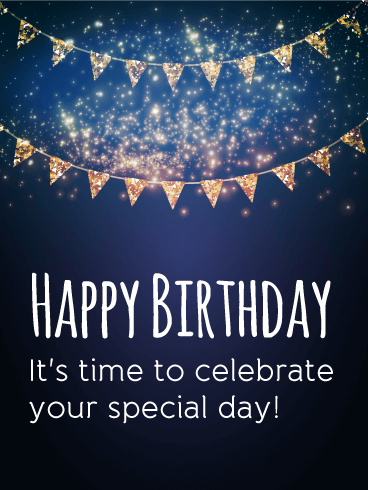 Don't wait a minute to send your niece a great birthday card-it's fast, simple, and fun to send all kinds of awesome birthday cards to everyone you know and love! This is the card you've been searching for! The gold writing definitely makes a statement, and the ombre-style is right on the mark with the latest trends. The solid purple bottom half adds an element of simplicity, as well. 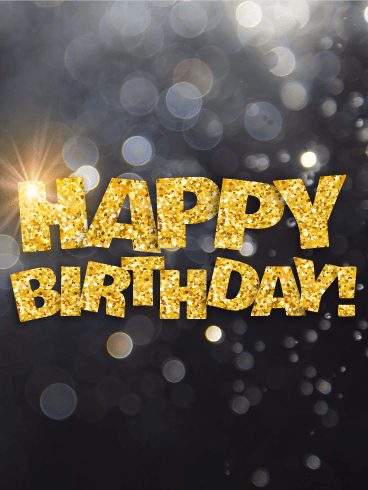 Everyone loves glitz and glamour, especially on their birthday! 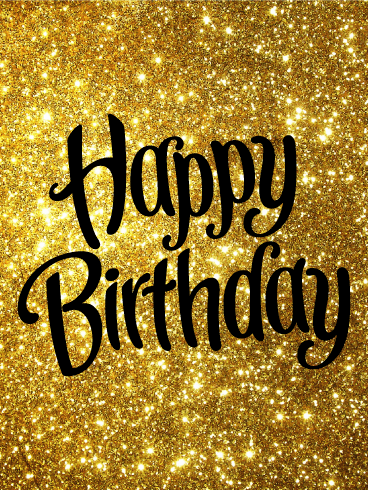 For the special person in your life celebrating their birthday, make their day with this fabulous, sparkling birthday card! Shaken or stirred? That's the most important question your friend will have to answer on her birthday! Wish a fabulous night to your fantastic friend. 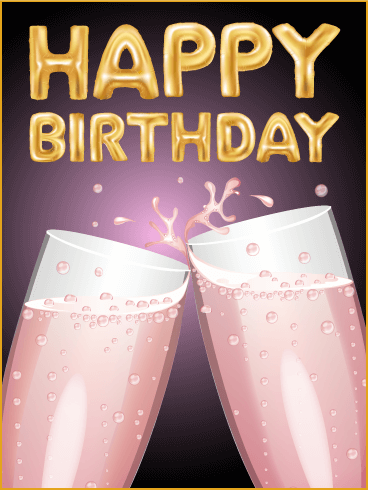 Say happy birthday in style with this glitzy martini birthday card. 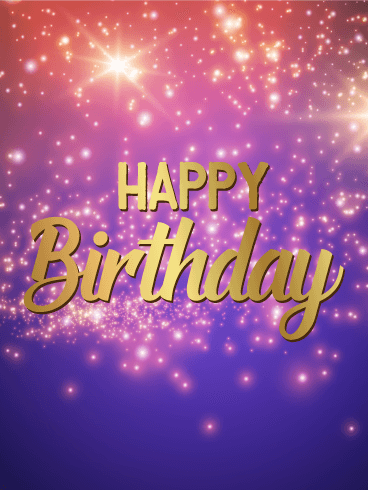 A simple and perfect birthday message for your friend's birthday that is fast and fun to send. 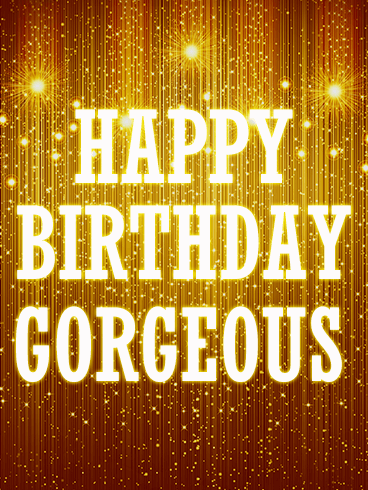 Light up the night and light up her life with this glamorous birthday greeting card to let her know how fabulous she is! Every superstar grandson deserves a spectacular surprise on his birthday! This birthday card was designed to help him celebrate in a big way! 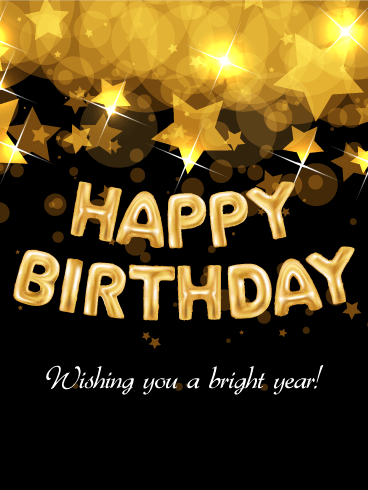 Golden bursts of light surround your best wishes for a happy birthday, which will surely make him smile bright, knowing you took the time to make him feel special! 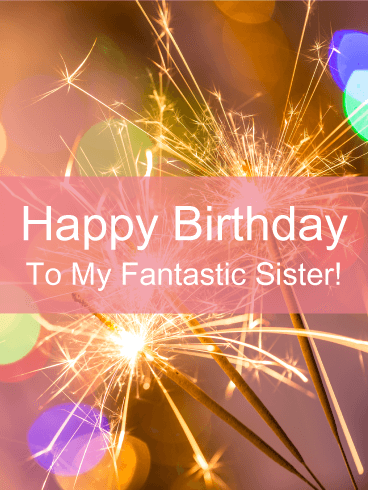 For a sister who outshines them all, send this stellar birthday card! 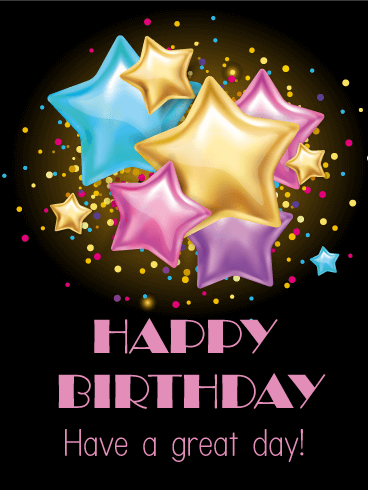 Send your sister a birthday card with a hundred shooting stars to wish upon and she is sure to have a great year! 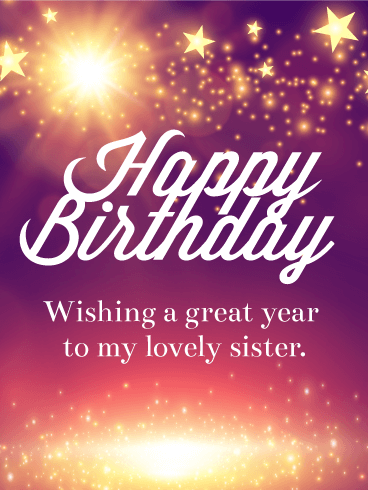 Birthdays are special and so is your sister, so don't forget to tell her so! Stardust is magical and enchanting and a gorgeous way to wish happy birthday to a lovely sister. We all have one day a year to celebrate our lives and pamper ourselves without care! 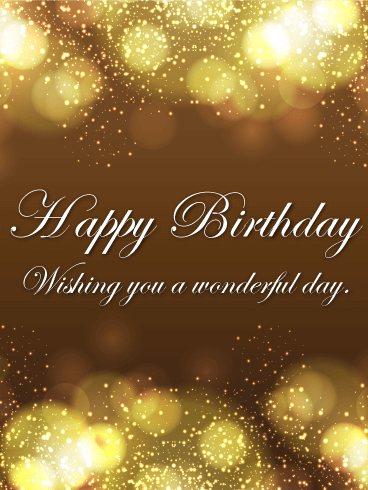 If you know someone who is celebrating a birthday today, send them this lovely Happy Birthday card! The fancy gold script speaks of the celebrator's importance and the many colorful lights symbolize the brightness they bring to your life. 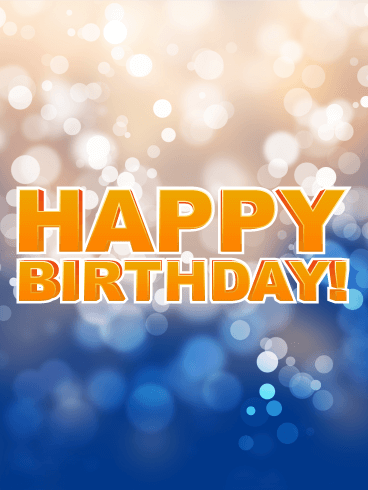 Send your birthday wishes to your loved one before the day is over! 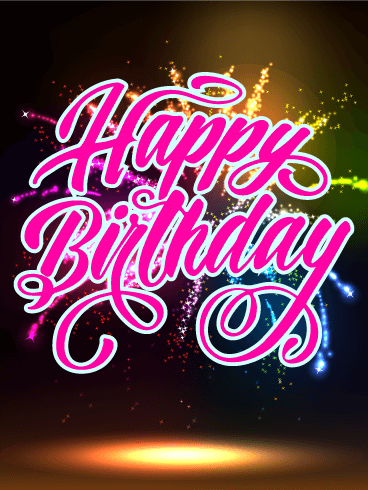 Light the candles or light some fireworks, because this birthday card is ready to celebrate! Emblazoned in pink and gold, with text in beautiful gold script, this birthday card is for everyone who loves sparks! Whether the recipient is sweet sixteen or was sixteen once, this birthday card is ready to party. 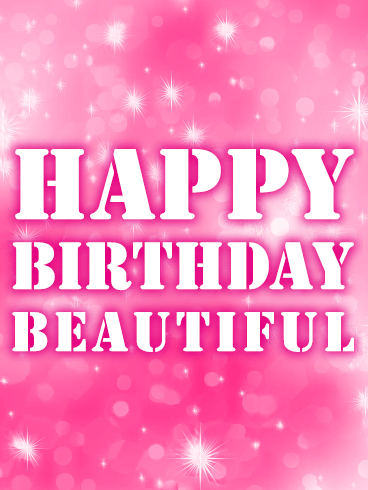 So send this birthday card and let them know that you know that their sparkle will never fade. 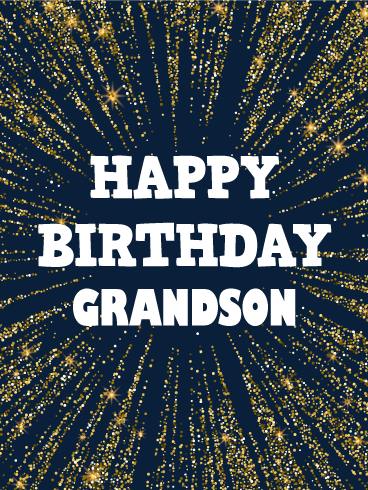 Bring the thought of shooting stars and fireworks into your grandson's birthday! There is nothing more heartwarming than knowing you are someone's shooting star on your special day. 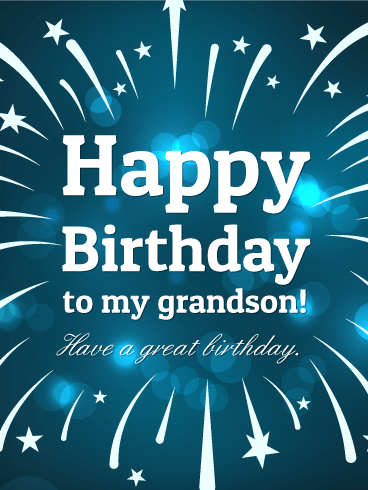 Do not forget to make your grandson feel that way today by sending him this birthday card! When you've got the best, you don't need the rest! Let your awesome husband know just how great you think he is. 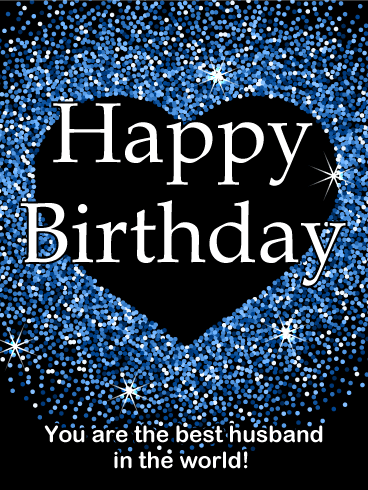 Send him this sparkly blue birthday card to celebrate the way he makes your life more wonderful every day. 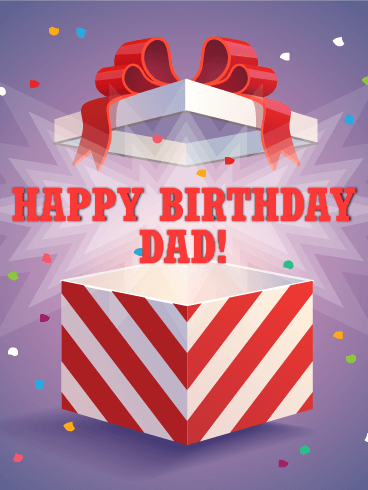 This big-hearted birthday greeting card is a thoughtful and flashy way to send him some love! 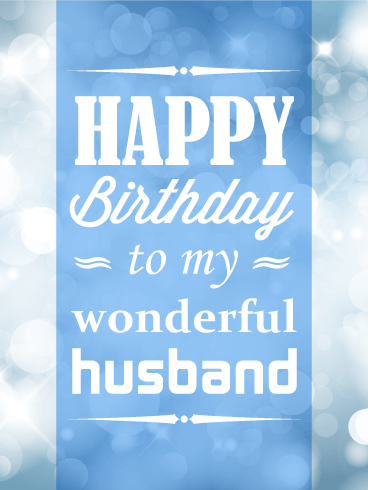 Wish your husband a happy birthday to really let him know you care. He's your rock. He's your anchor. 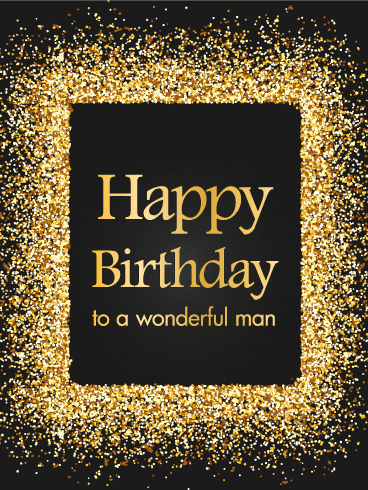 Wish your husband a happy birthday with this thoughtful birthday card. As you celebrate his birthday, remember the sweet moments and cherish the time you have together. Life is so fleeting and so precious. Spend his birthday showering him in love. 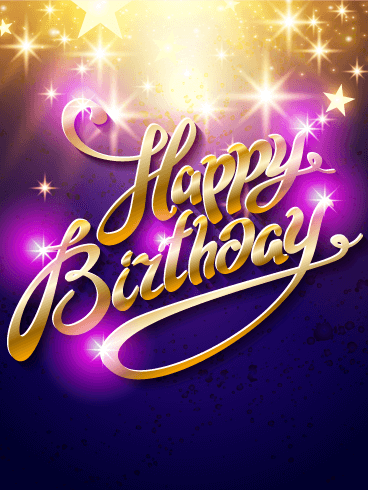 Send this dreamy blue birthday card to him to let him know just how wonderful he is to you. 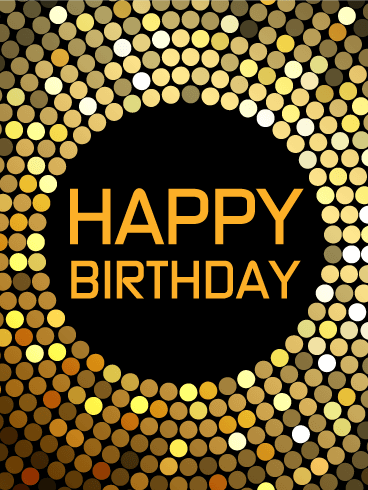 Pick this birthday card for the star in your life, someone who should be in the spotlight. They may not even think of themselves like that, but you know better. Let them know that their birthday deserves massive celebration or at least a massive fireworks display. 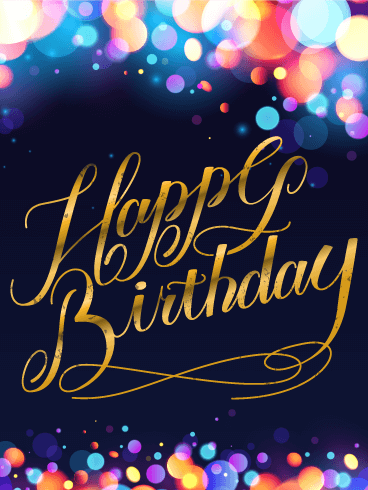 Send this exciting birthday card today to your special someone! This birthday card really pops! 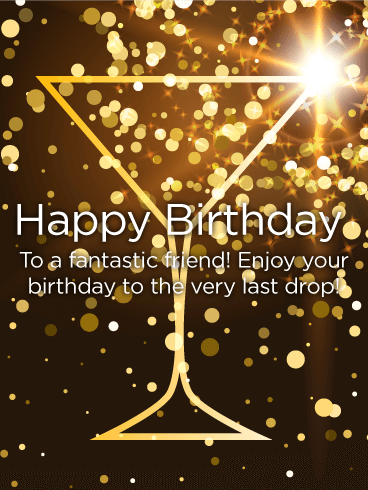 Dazzle your friend with a sparkling birthday greeting. 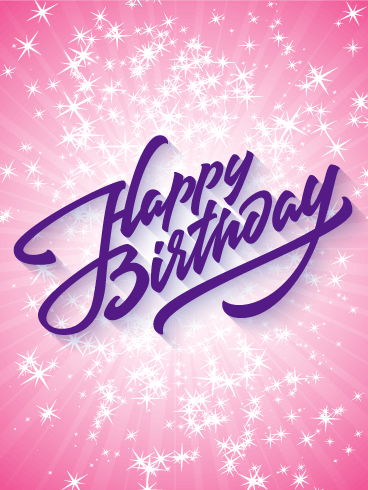 The bubblegum pink backdrop and twinkling stars that burst on top make for a fun and festive birthday card. 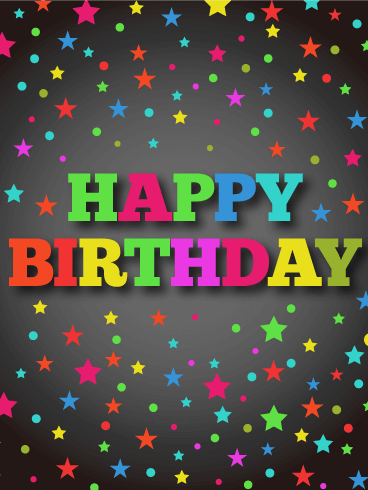 Happy Birthday is spelled out in italic, purple font for a simple greeting that is still full of pizzazz. 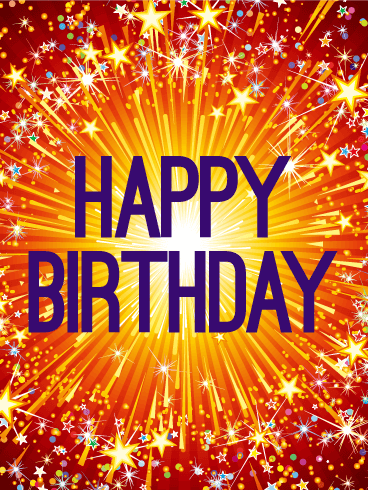 Like stars exploding through the galaxy, this awesome birthday card is a great choice for a stellar friend.